Cape Town - A defiant half-century by Yaseen Vallie followed by some bad light and rain helped the Warriors escape with a draw from their Sunfoil Series clash against the Titans at Sahara Park Willowmoore in Benoni on Monday. Vallie struck 55 (102 balls, 3 fours, 1 six) and was still there when the players were forced off for bad light. Rain arrived with the Titans needing three wickets for victory in the final 34 overs. The Warriors had slipped to 141 for seven in pursuit of a 281-victory target after the Titans had earlier declared on 220 for six. The result meant that both sides had drawn their opening three fixtures with round four due to begin on Monday, October 16. But the home side will undoubtedly be thinking about what may have been after they made all the early moves on day four. They started out on 97 for two, but were troubled initially after AB de Villiers (32) and Heinrich Klaasen (23) fell without adding to their overnight scores. Farhaan Behardien scored briskly in an unbeaten 59 (75 balls, 8 fours, 1 six) and Henry Davids (45 off 69 balls) was equally aggressive allowing the Titans to end their innings with well over 70 overs to bowl. Simon Harmer took four for 84 to finish with eight wickets in the match. Migael Pretorius (3/30) landed a double blow to the Warriors by dismissing Eddie Moore and Colin Ackermann, both for ducks, at the start of the second over, before Gihahn Cloete's 30 led a mini recovery. 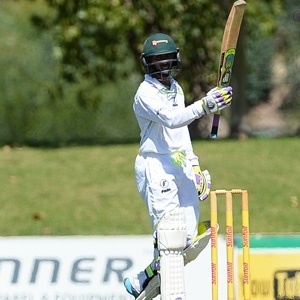 Alfred Mothoa (2/10) sparked a collapse that saw the visitors fall from 50 for two to 91 for six. Vallie and Sisanda Magala (29) fought bravely in a 50-run stand, but the latter fell with what turned out to be the final delivery. The players then went off shortly after tea and never returned, leaving the match to end in a draw. Who will you be backing in this year's Sunfoil Series?